Back in the Seventies a sequence in DC's Shazam comic had Billy Batson and Uncle Dudley travel the US in a motor home. Along the way they gave the readers history lessons. Sounds corny? It was, a little; it was also wonderful, as DC threw in a little book learning alongside the superheroics. And you know what? The format still works today, as shown by this outstanding issue of an always great series. The book starts on an amusing note, as Superman heads home to Hamilton after several days of helping folk in trouble. 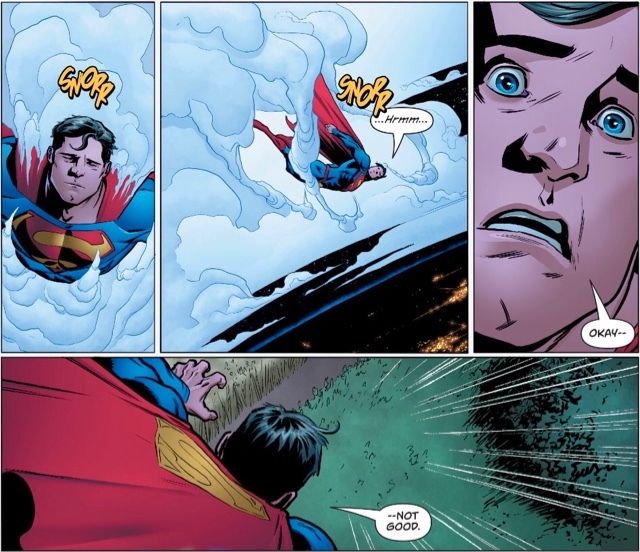 I don't think I've ever seen Superman sleep-flying and it's wonderful to be surprised after all these years. 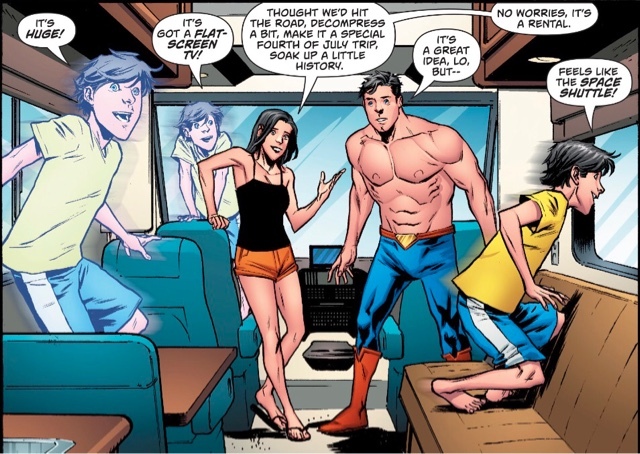 Next day, Lois surprises hubby Clark with a motorhome she's hired - the Kents have had, to understate matters somewhat, a busy time of late so they're taking a holiday. Son Jon couldn't be more excited. Each family member gets to choose two places of historical interest to stop off at on their way to the non-negotiable Gettysburg (you don't argue with army brat Lois Lane). 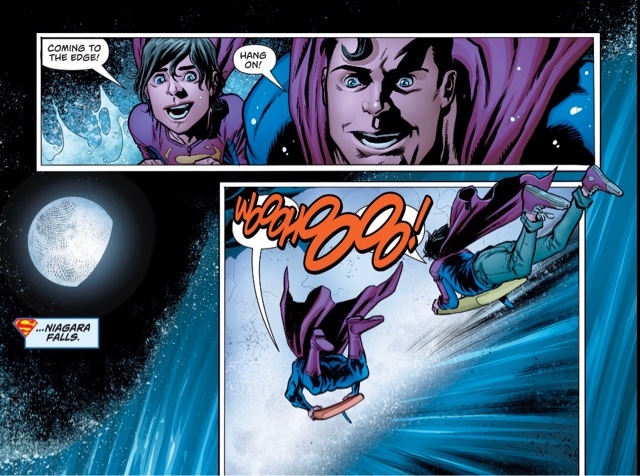 But first, Jon gets to play waterslide, Superman Family style. 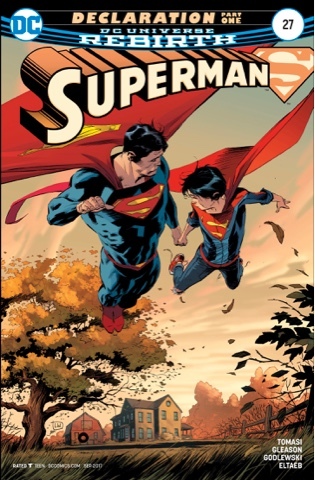 The rest of the issue sees the Kents visit Sharon, Massachusetts; New York City; and Philadelphia, where they learn about two particular heroes, one dead, and one living. The common thread is that both could have been treated better by the country for which they fought. Sadly, this isn't a problem confined to the US. Clark and Lois give Jon lessons in humanity along with the history, and I admit, I teared up a little. It's terrific to see the Kents stand up for what's right even when they're not battling costumed villains. 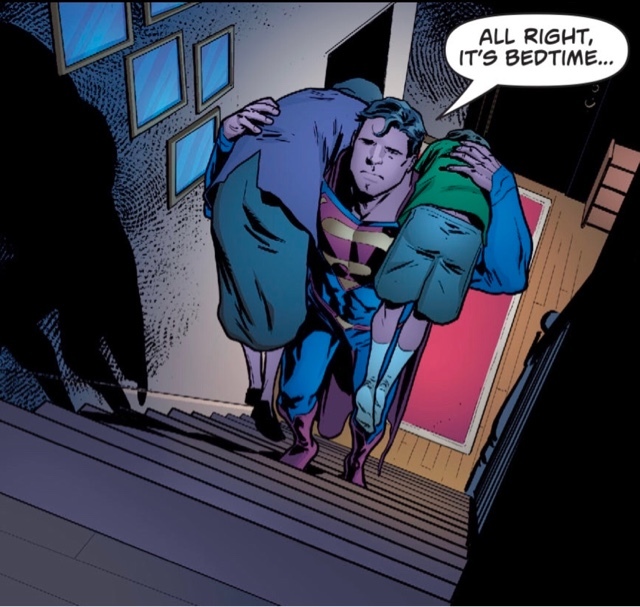 The Kents simply radiate family warmth as written by Peter J Tomasi and Patrick Gleason, while the new characters ring true ... all too sadly, in one case. Scott Godlewski drew last issue, he's back again, and I really hope he's going to be a regular contributor to this series; his sensibility meshes beautifully with that of Gleason and Tomasi. There's a terrific sense of play about the work, with subtle expressions and well-observed body language. Look at his ability with perspective, Superman's legs receding, Lois and Jon thrust in our face - that's talent. Spoiling the digital-powered reader, DC offers two covers: the main, by illustrator Lee Weeks and colourist Brad Anderson, perfectly captures the idea of floating away, while the variant, by Jorge Jimemez, is simply stunning. It perfectly encapsulates the feel and themes of the issue. It looks like a homage, but I can't find a source painting, and my memory of a Golden Age Batman, Robin and Superman in similar mode isn't paying off. Can anyone help? 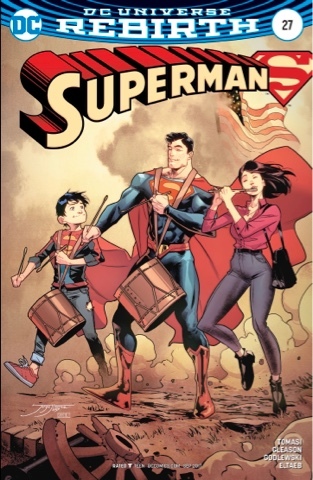 This is an issue with no traditional superheroics, but it's filled with tales that should be told, a sense of family love, and a call for respect for all. If next issue is as good - and I'm certain it will be – I'd love to see DC make it available digitally to schools, or perhaps some US public service body will stump up for a collected comics edition. Entertainment plus learning? Now that's super. You're good Gilberto, Marvel Family #23! And as Gilberto alludes, it's based on The Spirit of 76 by Archibald Willard. Great issue! One correction to your review: They go to NYC to see the World War I statue, but they meet the wounded vet (and go to Independence Hall) in my hometown of Philly! Thanks Rob; I shall correct the text but leave your comment, because people should know how smart you are! Issue of the year. Easily. Only quibble is I've never been sure about post-Lois having black hair as well. 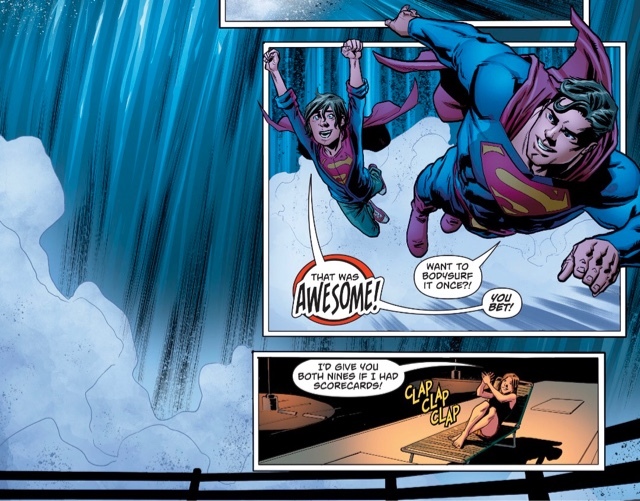 It's brown in Super Sons. So much dye, that woman has.